It is therefore that I am standing here with a sense of deep appreciation and gratitude, that I declare the Opportunity mission as complete. For more than a decade, Opportunity has been an icon in the field of planetary exploration, teaching us about Mars’ ancient past as a wet, potentially habitable planet, and revealing uncharted Martian landscapes. These words, spoken on February 13th, 2019, marked the official end of the longest running rover mission thus far to another planet. Designed to last just 90 Martian days and travel 1,000 metres (1,100 yards), the Mars Exploration Rover (REM) Opportunity vastly surpassed all expectations in its endurance, scientific value and longevity. In addition to exceeding its life expectancy by 60 times, it travelled more than 45 km (28 mi) by the time it reached its most appropriate final resting spot on Mars – Perseverance Valley. Across a decade and half, Opportunity – or “Oppy” to its fans – captivated people’s imaginations around the globe, and while it became somewhat overshadowed by its much bigger cousin, Curiosity, from 2012 onwards, “Oppy” nevertheless broke the ground for the surface exploration of Mars, together (for a time, at least), with its sibling rover, Spirit. From the outset, the MER programme was a daring one: to place two vehicles on the surface of Mars, capable of self-driving across the surface and carrying out a range of scientific tasks. At the time it was conceived, Mars was known to be a notoriously difficult target to reach: for some reason over one-third of the missions intended to reach the Red Planet failed. Some were lost shortly after launch; others failed whilst en route; other experienced upset or failure on arrival. Indeed this Hence why the MER project had two rovers: if one fell afoul of the Great Galactic Ghoul, the other would survive. 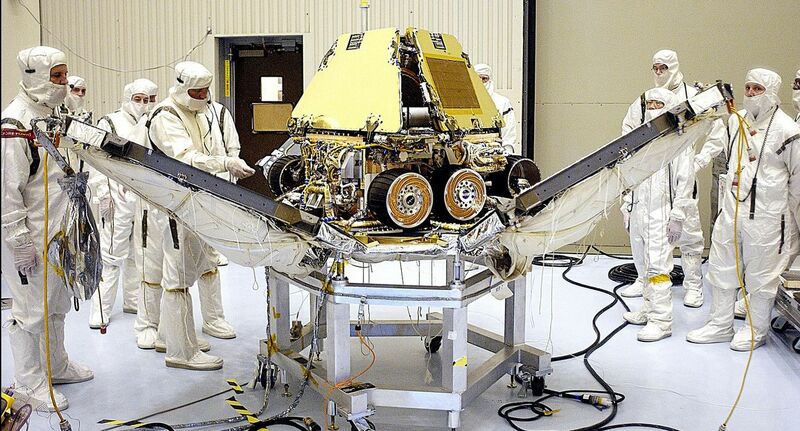 To pave the way for the rovers, NASA undertook the Pathfinder mission in the late 1990s. This comprised a Mars lander complete with a very small-scale (just 65 cm / 2.2ft in length) rover called Sojourner. 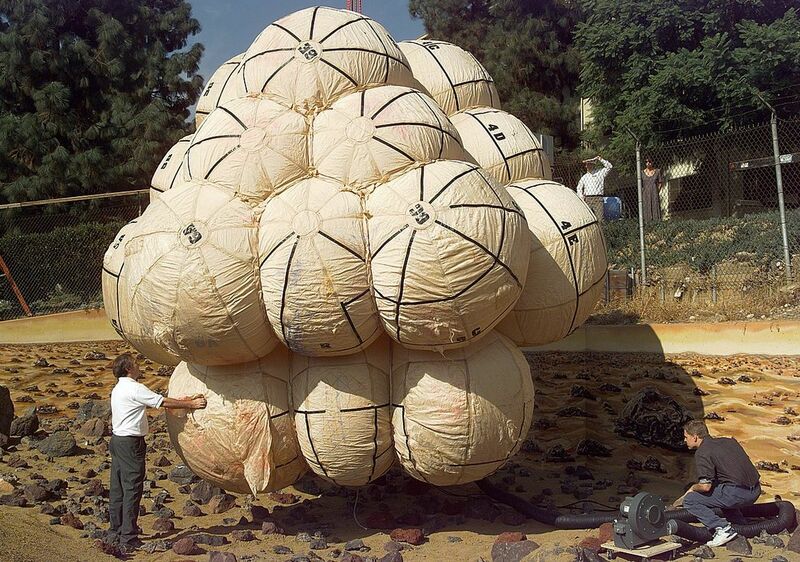 While both the lander and the rover carried science instruments and carried out worthwhile science, a major element of the mission was to test the entry, descent and landing system the MER mission would use: a completely loopy sounding mix of parachutes and a cocoon of air bags designed to rapidly inflate around a payload just before it reached the surface of Mars and protect it and it bounced its way to a resting position before deflating, the payload automatically righting itself in the process. In many respects, the Pathfinder mission (the lander from which are later renamed the Carl Sagan Memorial Station, in honour of the great planetary scientist, humanitarian, global thinker and Mars exploration advocate, Carl Sagan) was the MER’s mission lucky charm. Not only did the mission prove the landing system, necessary because “conventional” retro-rocket landing systems would have massively increased the complexity and cost of sending large rovers to Mars, both lander and rover operated far beyond their anticipated life spans: the lander for 9 months (compared to an anticipated 85 days) and the rover for 85 days (rather than the anticipated 7 days. Incidentally, it Sojourner was the first Mars mission to employ a form of VR: the “driver” on Earth would wear a set of 3D goggles that visualised the rover’s surroundings digitally, so a path to be mapped using a special “driving” system. The driving commands would be saved and later transmitted to Mars as a batch of commands the rover would then execute). The MER rovers were launched in June (Spirit) and July (Opportunity) of 2003, and arrived on Mars on January 4th and January 25th, 2004, respectively, just after Europe’s Mars Express mission had arrived in Martian orbit at Christmas, 2003. The landings were fraught with concerns: the UK’s Beagle 2 lander, delivered to Mars by Mars Express, had arrived on the planet on Christmas Day 2003, but all attempts to communicate with it had failed. Obviously, the EDL systems for both landers worked perfectly. Spirit landed in Gusev crater, originally thought to be a dry lake bed. However, the rover’s findings disproved this, revealing the crater to be largely filled with natural debris. In all, Spirit operated on a mobile basis for almost 5 years and 4 months before it became bogged down in a “sand trap” on May 1st, 2009. When attempts to free it failed, the rover became a static station until it stopped communicating in March 2010. NASA then spent 14 months attempting to re-established contact before declaring Spirit’s, mission was at an end on May 24th, 2011. Opportunity landed half a world away in Meridiani Planum, where sedimentary rocks and hematite had been spotted from orbit. Hematite is a mineral that on Earth forms in hot springs or pools of water. The hematite was embedded in the sedimentary rocks, which also form in the presence of water. While both rovers were built to last longer than their 90-day primary mission, it was assumed the combination of natural degradation within the solar cells used to generate electrical power and dust deposited on the flat solar arrays themselves, would eventually result in both rovers being unable to generate sufficient energy to charge their batteries. However, when it came to dust accumulation on the solar arrays, both rovers had an unexpected ally: seasonal dust devils. These tiny tornadoes would, from time-to-time, pass directly over the rovers, effectively cleaning their solar panels, boosting their ability to generate power. Even so, no-one imagined that “Oppy” would still be operating on Mars well over a decade after it had arrived, with a career of making remarkable discoveries. Not that it was all plain sailing: in April 2005, NASA ordered the rover into a “blind drive” mode, so it was not checking for obstacles, as it was believed the route it was taking was free of significant dangers – but “Oppy” rolled into a 30 cm (12 in) high sand dune, where it remained trapped for five weeks before being successfully freed. One of Opportunity’s greatest scientific findings was confirming the presence of standing water on Mars for long periods. As well as hemtite, the rover found gypsum and other rocks that tend to form in water on Earth, and also found evidence of ancient hydrothermal systems. 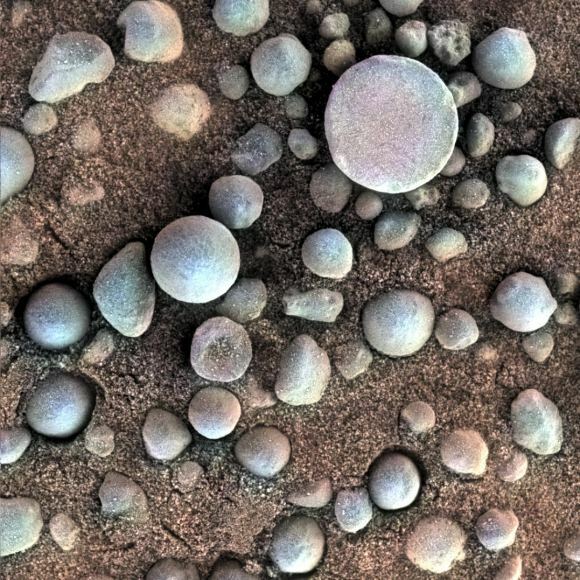 Later in its mission, “Oppy” added to the catalogue of evidence pointing to standing water once having been present on Mars with the discovery of jarosite. What excited scientists about this is that while jarosite forms in extremely acidic water, microbes can survive in it – opening the door to the potential that the waters on Mars might have once been capable of bearing life. As a part of its journey, Opportunity explored two craters: Victoria Crater and the much larger Endeavour Crater, which would become the rover’s eventual resting place. In some respects, the 2006/7 exploration of Victoria Crater was a portent of things to come. In June 2007, the rover started a descent to the crater’s floor. However, in July it was interrupted by a severe dust storm struck, and “Oppy’s” power-generating capabilities dropped by 80 percent in a week, then hit critical levels, forcing it into a “safe” mode to preserve its remaining energy. 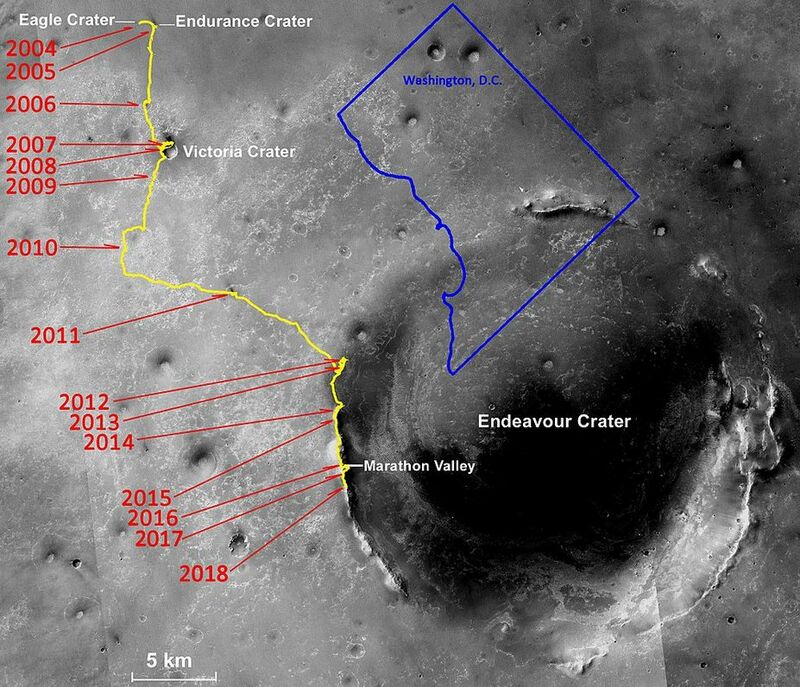 Fortunately, the storm was relatively short-lived, and “Oppy” was able to resume its descent in late August 2007, reaching the floor of the crater in September 2007, where it spent almost a year exploring, in the process confirming Victoria Crater had once been home to standing water. Opportunity’s water history examinations continued at Endeavour Crater, which it reached in 2011. It spent three years exploring the rim of the crater, during which time NASA worked to overcome issues with the rover’s flash memory. This memory allows the rover to store information even when it is powered off, such in the case of a bad storm. 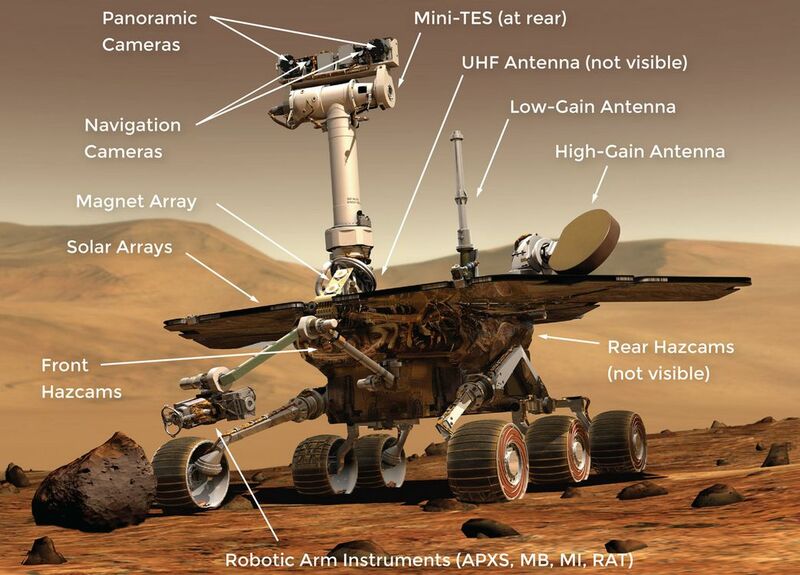 Unfortunately, these efforts were not successful, and “Oppy” was left with only random access memory to store data, and which could only retain information while there was power to do so. In 2016, Opportunity’s mission was further extended by NASA for a three-year period through until October 1st, 2019. This allowed plans to be drawn up for a descent the the crater floor, going by way of a a feature dubbed “Perseverance Valley”. This is an ancient fluid-carved valley possibly formed by the action of liquid water. As a spillway, it offered the most positive means for the rover to reach the crater’s lower levels. As of June 17th, 2017, Opportunity had spent over 4763 Sols (Martian days) exploring Mars, travelling more than 44.5 km (27.8 mi). During that time it had recorded more than 220,800 images and carried out extensive studies of its surroundings, producing – as noted – strong and extensive evidence for water to have once been commonplace on Mars. At that time, power output from solar arrays was at 343 watt-hours, compared to 900 watt-hours at the start of the mission, which meant the rover was still capable of carrying out its science mission. 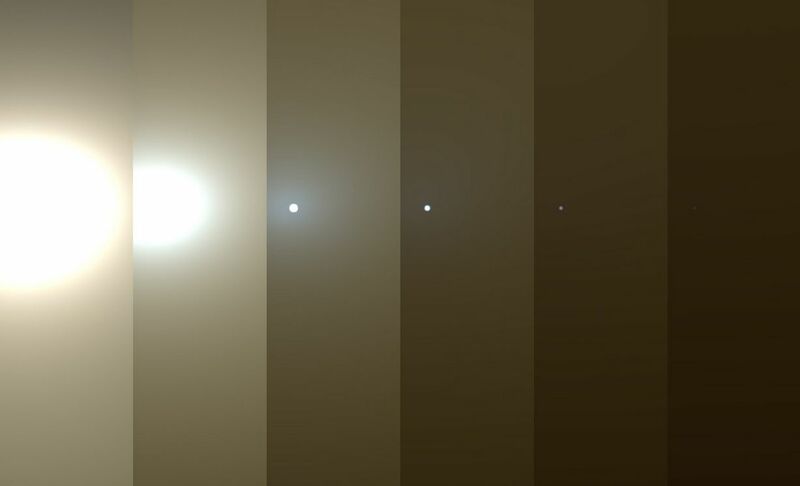 This continued to be the case until May 2018, as Opportunity was descending “Perseverance Valley”, when another dust storm started affecting the area. But June this had reached a point where the dust in the atmosphere was dense enough to trip the rover into a safe mode. 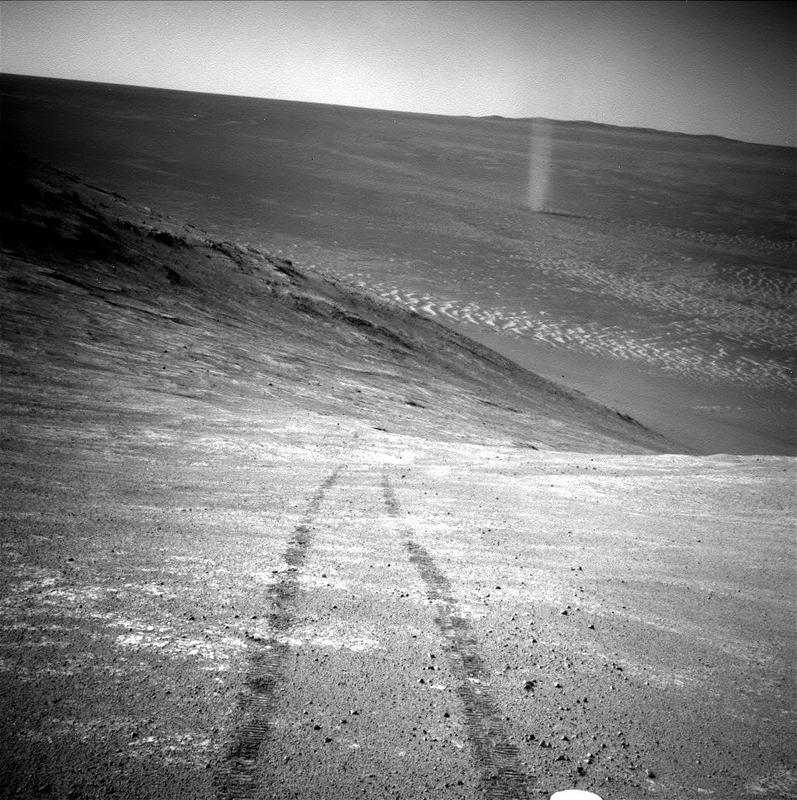 The last communication from “Oppy” was received on June 2018; in basic terms it reported,”my battery is low and it’s getting dark.” It had been hoped that with the rover placing itself in a “safe” mode to conserve power, coupled with the increase in surface temperature as a result of the dust being a good insulator of heat, Opportunity would come through the storm OK. Attempts to re-establish contact resumed in August 2018, as the dust suspended in the atmosphere finally abated to a point where Opportunity should be able to start recharging its batteries once more. Several potential faults which might prevent the rover from communicating or responding to communications were identified, and attempts were made to try to work through them. However, by the end of 2018, nothing had been received from the rover. In mid-January, NASA indicated that they would be switching to a new means of trying to coax “Oppy” into replying to attempts from Earth to re-establish contact that would last “several weeks”. However, on February 12, 2019, the final four sets of commands were transmitted to Opportunity over a 25 minute session. This final attempt was followed by the formal announcement of the end of Opportunity’s mission, and communications were officially disabled on February 15th, 2019 at 05:25 UT. The news was met with an outpouring of sympathy as support across social media – with Twitter carrying the hastag #ThankYouOppy. 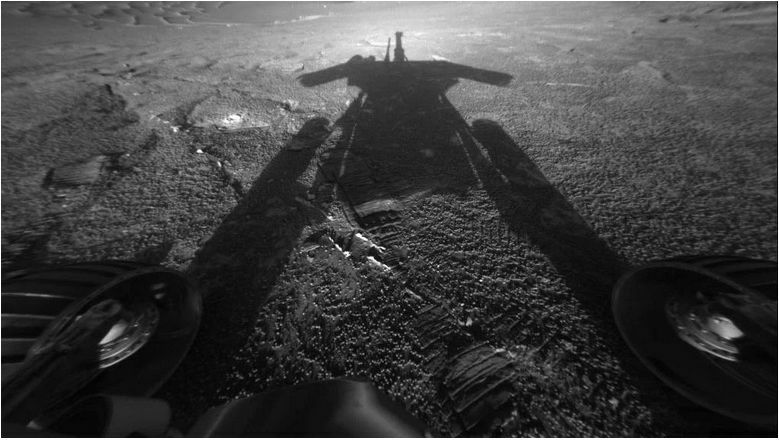 Given that “Oppy’s” mission has been followed by so many space enthusiasts – and has even be part of half of their lives for some, and the greater part of their careers for those who worked on the MER project – such an outpouring was in many ways to be expected. But it was left to NASA Administrator Jim Bridenstine to sum-up the mission. I finished reading this with a tear in my eye RIP Oppy.